Forming in 2012 out of a mutual admiration for Blind Guardian, vocalist John Yelland and guitarist Tony Cordisco started Judicator to keep the tradition of US/Teutonic power metal alive. They’ve garnered healthy support through crowdfunding and critical acclaim through their three previous full-lengths – bringing us to The Last Emperor, the fourth record and first in three years for the band. Safe to say if you are an ardent follower of the genre and live for those glorious vocal harmonies and equally sturdy rhythms as well as twin guitar refrains that make hair stand on edge to take the battlefields confident of victory – Judicator should solidify your ideal listening experience. From the opening Judas Priest/Vicious Rumors-like slower twin guitar line that builds into a triumphant anthemic arrangement for the title cut, it’s easy to hear that the quartet focus heavily on catchiness from all facets of their songwriting. Refrains to sing along to, guitars to simulate, bass and drumming that hammer home the prevalent power, and a boatload of choir-laden vocal interplay, it’s all in there to remind us of what the essence of traditional power metal should be about. The People’s Crusades and historical figure storyline matches up seamlessly to the proceedings, especially during the speedier “Raining Gold” and the calmer, acoustic-opening which shifts into Iron Maiden/Helloween electric ecstasy for “It Falls to Jerusalem”. Many may place Judicator into a Blind Guardian worship category (think Follow the Blind through Imaginations era) – and while there are numerous qualities to their riffing, songwriting, and melodies/harmonies that certainly take influence from the Germans, it’s put in more of a US finesse context. Gaining the seal of approval from Hansi Kürsch himself in duet form with John on “Spiritual Treason”, the musical backbone has a bit more of that Riot / Thundersteel edge, and the 8:09 follow up “Antioch” contains vocal supplementation from David Brown, the epic song possessing some of the more vicious riffing of the record against the shimmering natural ever-present electric power and acoustic dynamics. It doesn’t hurt to have a stunning battle scene from Marc Whisnant on the cover, plus vocal engineering from the seasoned Charlie Bauerfeind if you want to be taken as seriously as the veterans of your genre. 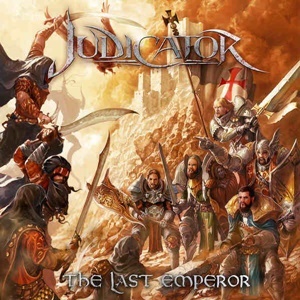 The Last Emperor continues to place Judicator at the top of not just the US power metal scene -but one of the best acts keeping the movement alive internationally.